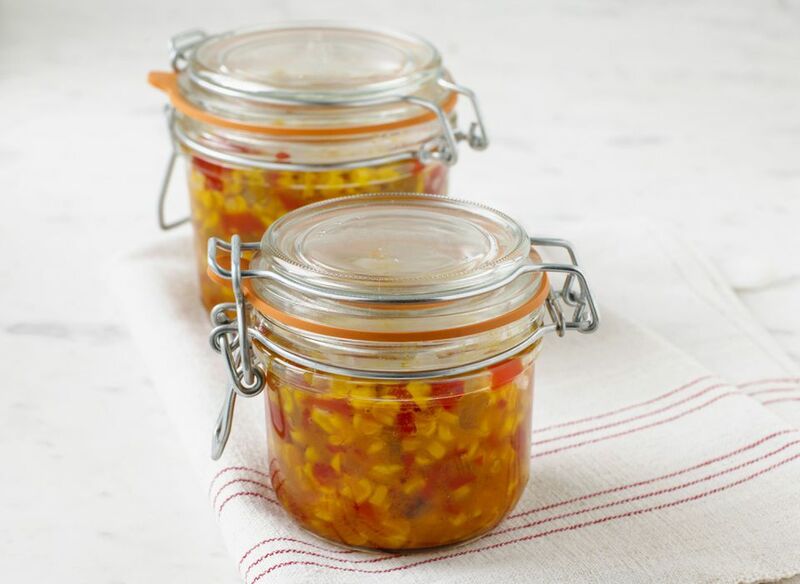 This homemade corn relish is a sweet relish made with fresh corn, sweet peppers, and tomatoes. It's a delicious (and prize-winning!) relish. Bell peppers, tomatoes, and chopped cucumbers are combined with sweet fresh corn kernels to make this delicious corn relish. Use this corn relish as a side dish or condiment with beans or barbecue, or use it as a sandwich topping. It's wonderful on fish tacos and burgers. Fill a large boiling water bath canner about three-quarters full. Add the empty canning jars and bring to a boil. Reduce the heat to maintain a low simmer. Put the lids and bands in a saucepan and cover with water. Bring to a simmer and keep them hot over the lowest heat. Combine prepared vegetables in a large, nonreactive saucepan or Dutch oven. Add vinegar, sugar, salt, turmeric, and mustard seed. Fill the hot canning jars, wipe the rims and threads with a damp cloth, and then place the hot lids on the jars. Screw the bands on the jars, but don't over-tighten them. Put the filled jars in the hot water in the canner. If the water does not come up to at least 1 inch above the tops of the jars, add more hot water. Bring the water to a boil; cover the pan and reduce the heat to maintain a gentle boil. Boil for 15 minutes. See below for high altitude times. Process for 15 minutes in a boiling-water canner, or 20 minutes for altitudes of 1001 to 6,000 feet. Over 6,000 feet, process for 25 minutes.